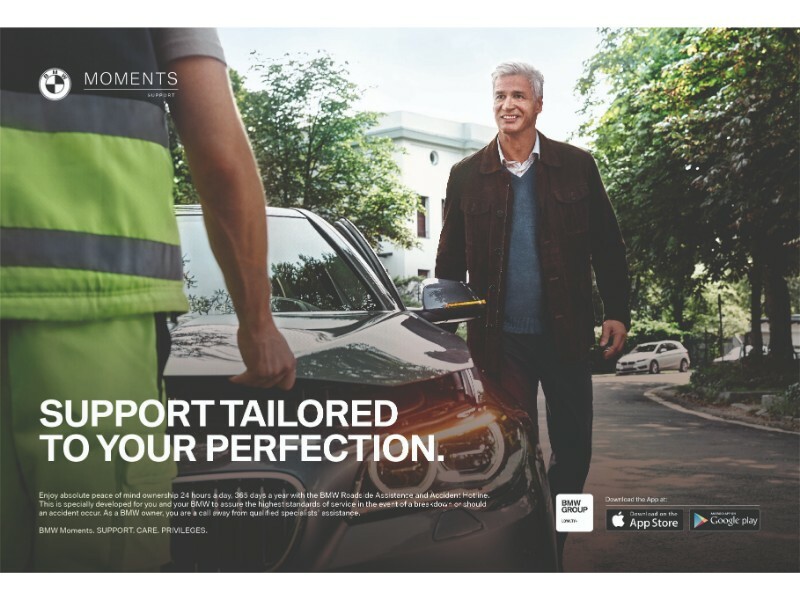 Home / LIFESTYLES / BMW MALAYSIA ELEVATES PREMIUM OWNERSHIP EXPERIENCE WITH BMW MOMENTS. BMW MALAYSIA ELEVATES PREMIUM OWNERSHIP EXPERIENCE WITH BMW MOMENTS. privileges and benefits tailored to perfection for Sheer Driving Pleasure. BMW Malaysia today introduced BMW Moments – a one-of-a-kind ownership privileges programme curating all exclusive ownership experiences and services to deliver the comprehensive and complete BMW Group Malaysia Premium Ownership Experience. BMW Moments represents the range of best-in-class services and privileges that every BMW owner is entitled to. This ranges from providing flexible and innovative financing options; reliable premium care and assistance; to elevating customers’ sheer driving pleasure through an array of exclusive lifestyle privileges; all of which are delivered through three distinctive categories including BMW Support, BMW Care and BMW Privileges. 24/7 PEACE OF MIND WITH BMW SUPPORT. Under BMW Support, BMW owners are guaranteed absolute peace of mind with the BMW Roadside Assistance and Accident Hotline. The emergency aftercare protection service programme adds a level of safety and convenience on the road for all BMW owners. Available to customers 24 hours a day, 7 days a week, and just a mere call away, qualified specialists from the call centre will take care of absolutely everything that needs to be done in the event of a breakdown or accident. The program offers lifetime phone assistance and organizational support, as well as comprehensive mobility services in case of an emergency, immobilisation or break down at no cost for new owners. Warranty programmes for uncompromising driving experience with BMW Care. As part of the complete premium ownership experience, all new BMW vehicles come with the BMW 5-Year Unlimited Mileage Warranty with Free Scheduled Service. The manufacturer-backed warranty will be offered up to the fifth year of ownership with unlimited mileage. By extension, the programme also includes free scheduled service and maintenance for up to 100,000km. The scope of services with the warranty programme is in accordance to the Condition Based Service (CBS) status and includes engine oil service with oil filter and refill quantity, air filter, micro filter, spark plugs, brake fluid and service vehicle checks. The BMW 2-Year Tyre Warranty programme entitles owners to a comprehensive tyre protection plan that covers tyre damages caused by any sharp objects or by hitting the edge of a curb or pothole. For new cars, a complimentary BMW Tyre Warranty is provided on all four BMW Approved Star-Marked Tyres that come factory fitted with the new BMW car; for aftersales purchases, a complimentary BMW Tyre Warranty is available on any BMW Approved Star-Marked Tyres purchased from any BMW Authorised Dealer. Engineered in collaboration with leading tyre manufacturers around the world, BMW Approved Star-Marked Tyres are the only tyres manufactured exacting to the performance standards of a BMW vehicle. The precise harmonisation of the wheels, tyres and chassis components are essential to achieving optimum handling and performance. Only tyres bearing the star are guaranteed premium features and properties exclusive to BMW Approved Star-Marked Tyres. Enjoy innovative financing and the finer lifestyle with BMW Privileges. Owning a BMW car opens up doors to a suite of benefits and privileges exclusive to BMW owners, under the BMW White Card, BMW White Card Elite, or the BMW Excellence Club for the BMW 7 Series owners. Whether it’s receiving invitations to exclusive BMW events or a host of dining, shopping and lifestyle offerings, the BMW owners club is the gateway to an incomparable premium lifestyle. BMW Malaysia also makes owning a BMW vehicle an effortless experience with its range of industry-leading financing programmes. Flexible loan tenures and interest rates are available through innovative purchase solutions such as the BMW Full Circle Programme, BMW Balloon Financing and BMW Step Down Financing. To find out more about BMW Moments, visit https://www.bmw.com.my/BMWMoments or access the world of privileges on the go as a BMW customer via The BMW Group Loyalty+ Mobile App, available on the Apple App Store or Google Play. For information about BMW Malaysia and its range of premium products and services, visit www.bmw.com.my. BMW EfficientDynamics was coined by BMW more than a decade ago to define the company’s long term sustainable strategy to produce fuel-saving and alternative vehicle concepts through clean production processes. It is an array of technologies that are already fitted as standard across practically the whole model range. As the manufacturer with the most comprehensive programme for reducing fuel consumption and emissions, BMW EfficientDynamics are designed to enhance the performance and driving pleasure of the vehicles at the same time. In 2007, BMW was awarded a “Green Steering Wheel” for outstanding environmental innovation for its BMW EfficientDynamics technology. With its four brands BMW, MINI, Rolls-Royce and BMW Motorrad, the BMW Group is the world’s leading premium manufacturer of automobiles and motorcycles and also provides premium financial and mobility services. The BMW Group production network comprises 31 production and assembly Facilities in 14 countries; the company has a global sales network in more than 140 countries. In 2017, the BMW Group sold over 2,463,500 passenger vehicles and more than 164,000 motorcycles worldwide. The profit before tax in the financial year 2016 was approximately € 9.67 billion on revenues amounting to € 94.16 billion. As of 31 December 2016, the BMW Group had a workforce of 124,729 employees. The success of the BMW Group has always been based on long-term thinking and responsible action. The company has therefore established ecological and social sustainability throughout the value chain, comprehensive product responsibility and a clear commitment to conserving resources as an integral part of its strategy. BMW Group Malaysia is the representative of Bayerische Motoren Werke (BMW) AG in Malaysia with activities that cover the wholesale of BMW, MINI and BMW Motorrad vehicles, spare parts and accessories as well as the overall planning of sales, marketing, after-sales, and other related activities in Malaysia. The organisation’s presence in the country includes its National Sales Centre (NSC) in Cyberjaya and BMW Assembly Facilities at the Kulim Hi-Tech Park, Kedah which supports the Malaysian region as well as the BMW Group Data Centre (GDC), BMW Group Regional Training Centre (RTC) in Cyberjaya and BMW Group Parts Distribution Centre (PDC) at the Free Industrial Zone of the Senai International Airport in Senai, Johor which supports 22 markets in the Asia-Pacific region. BMW dealership network covers 39 outlets in various cities in Malaysia. AIRASIA RUNAWAY READY DESIGNER SEARCH 2017 ANNOUNCES THE TOP 2 FINALIST REPRESENTING MALAYSIA!